Landing on Mars is an incredibly challenging feat, a process that has claimed numerous probes and spacecraft over the last 50 years. On Monday, NASA landed its InSight Probe after it had traveled for six months through 300 million miles of space. According to the latest reports from NASA engineers, InSight has now deployed its array of solar panels so that it may recharge its batteries each day. The probe also beamed back its first clear photo of the Martian surface. 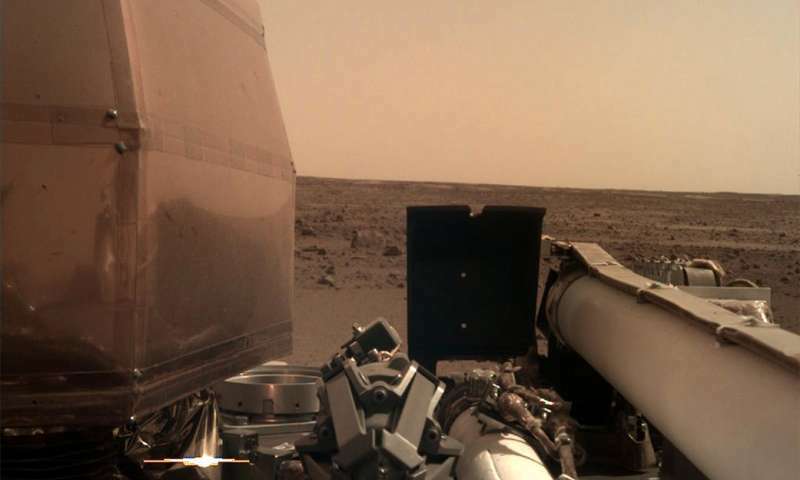 The picture was taken on November 26, 2018, the same day InSight landed on the Red Planet. The probe’s camera is still covered by a transparent dust cover meant to prevent damage to the lens upon landing. Credit: NASA/JPL-Caltech. The signal that the solar panels had been deployed successfully was transmitted to Earth at about 5:30 p.m. PST (8:30 p.m. EST) by NASA’s Mars Odyssey orbiter. The twin solar arrays are each 7 feet (2.2 meters) wide, when fully open. This now makes the lander about the size of a large 1960s convertible. But because Mars is so much farther away from the Sun than Earth, the amount of sunlight that reaches the Red Planet is also weaker. The panels should provide about 600 to 700 watts of power on a clear day and 200 to 300 watts the panels are covered in dust, which is practically the norm. Luckily, the probe’s sophisticated instruments do not require a lot of energy and InSight’s solar arrays should be more than capable of recharging the batteries. InSight’s mission is unlike that of any spacecraft we’ve sent to Mars. All of our past probes have studied the planet’s environment above ground, but InSight is focused on what happens beneath the surface by listening to ‘marsquakes’. By studying these slight seismic waves, scientists want to determine what makes up the planet’s mantle and core. Basically, InSight will study seismic waves as they pass through the Red Planet, using that information as a sort of ultrasound to find out what is lurking underneath the crust. Next, NASA will use a robotic arm to deploy instruments on the surface of Mars, among them the precious seismometer and a heat flow probe. However, it will take at least three months before there will be any seismic data available. That’s because NASA wants to make sure that the instruments are properly set up and calibrated. Meanwhile, InSight will use its weather sensors and magnetometer to make measurements from its landing site at Elysium Planitia.